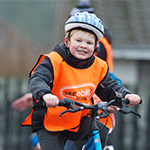 Each local authority receives a distribution of Bikeability Scotland resources twice a year. First sign in to the Cycling Hub. If you need a top-up of resources in between these main distributions, please contact us letting us know the quantity of each resource needed, and the delivery location. We would appreciate it if orders could be grouped together where possible, to save on distribution and delivery costs. There are also Gaelic versions of level 1 and 2 resources which are available to download or order. 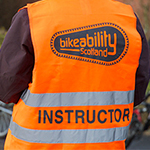 CTA - copies of all Bikeability Scotland level 1 and 2 resources, training resources booklet, a multi-tool, pack of cones and bag, CTA candidate manual, whistle, clipboard and hi-viz vest. CT - copies of all Bikeability Scotland level 1, 2 and 3 resources, training resources booklet, a multi-tool, pack of cones and bag, CT handbook, Franklin's Cyclecraft, whistle, clipboard and hi-viz vest. 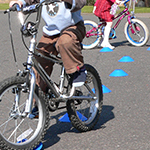 CT Plus - CTA trainer manual, CTA candidate manual, training resources booklet, trainer prompt cards for Bikeability Scotland levels 1 and 2. Electronic copies of the resources are available below to anyone with an instructor qualification (e.g. 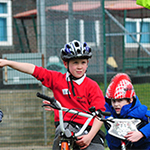 Cycle Training Assistant) - you will need to log into your Cycling Scotland account in order to access them. If you're a local authority co-ordinator without an instructor qualification, please contact us to arrange access.